Companion Dog Training offers professional positive, science-based methods of training and behaviour modification. We work in all of our classes and private sessions to ensure your dog can focus on your on and off-leash. Our classes are fun, positive and designed to increase the bond between you and your dog! Jessica Benoit was born and raised in Edmonton, Alberta. She shares her life with her wonderful husband, daughter, son, and their four dogs and cat. She is passionate about teaching pet parents how to best motivate and connect with their pets. She is always learning about the newest science-based methods of training to better serve her clients. She has a special interest in teaching children how to best interact with dogs and understand their body language, so everyone can stay safe and enjoy their pets. Jessica is a Registered Veterinary Technologist, Certified Professional Dog Trainer-Knowledge Assessed, Fear Free Certified Trainer and Licensed Doggone Safe presenter. She is currently working towards her speciality in behaviour as a Veterinary Technologist. 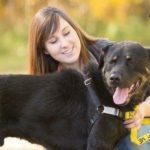 Chantal began studying the science of dog training through the Edmonton Humane Society’s Dog Behaviour and Training Methodology course. She has been involved in a mentorship program with Jessica Benoit for the past two years through Companion Veterinary Clinic. She is currently teaching our Puppy Socialization and Exploration class, Puppy Foundations classes, Trick Training 101 and Training Your Teenager class. Chantal attends continuing education seminars on postive, science based methods of training regluarly and has been accepted in the world renowned Karen Pryor Academy Dog Trainer Professional program starting April 2019. Chantal always had an interest in animals and surrounded herself with them as much as possible. She became interested in training after getting her dog, Blu and has attended multiple classes with her taught by positive, force-free trainers. Chantal loves to foster and rescue animals and is always looking to expand her knowledge in training. She currently has two dogs and one cat. 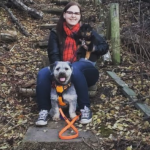 Shelby has been a Registered Veterinary Technologist with Companion Veterinary Clinic since graduating from NAIT in 2017. Shelby became interested in animal behaviour when she got her first rescue dog, Chia, and she is working towards specializing in that area. She is passionate about teaching pet parents how to interact with their pets in a positive, fear free manner and has been mentored by both Jessica Benoit and Chantal Turcotte. Shelby will be teaching both Puppy Socialization and Puppy Foundation classes. She is Fear Free certified and Low Stress Handling certified. She will also be attending the Karen Pryor Dog Training Professional Program later this year. In her off time Shelby enjoys spending time with her husband, two dogs, three cats, and two bunnies.